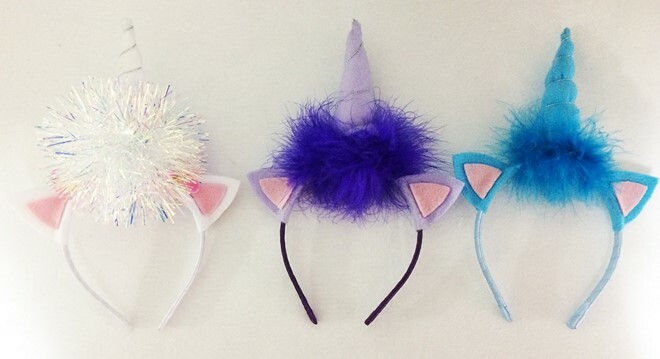 Unicorns are the biggest trend from last year. Some with big horns, others more discreet, with flowery or plush design. 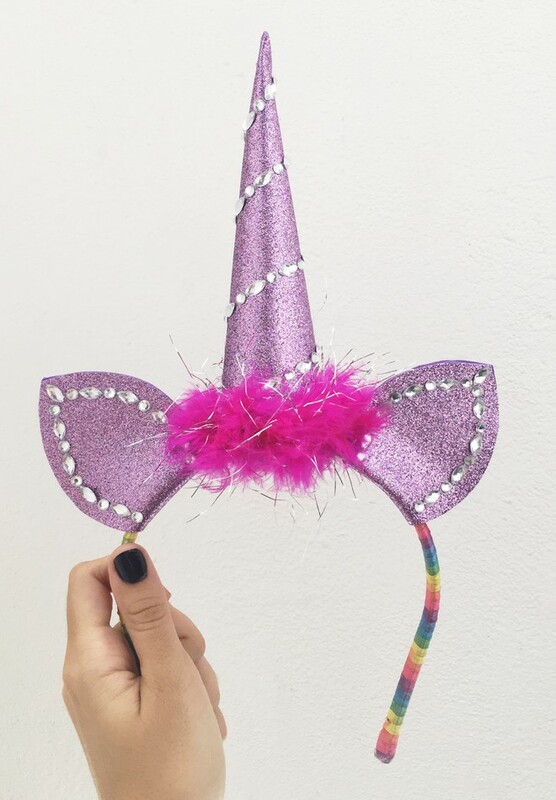 Unicorns are the new flamingos! And Google has already given the hint: this is the champion in Google Search charts for 2017. 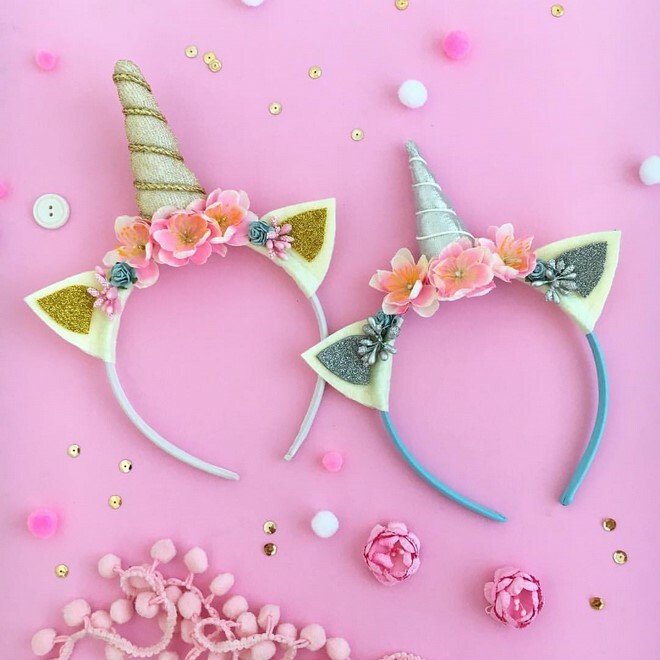 This includes Unicorn themed nurseries, birthday parties, unicorn-inspired foods even unicorn hair! 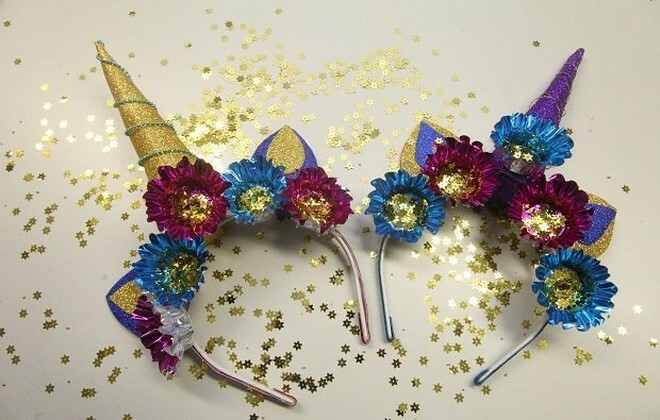 When thinking about carnivals or partys, it is inevitable not to mention the unicorn headbands decorated with glitter, rainbow colors and flowers. And they are actually pretty easy to make. 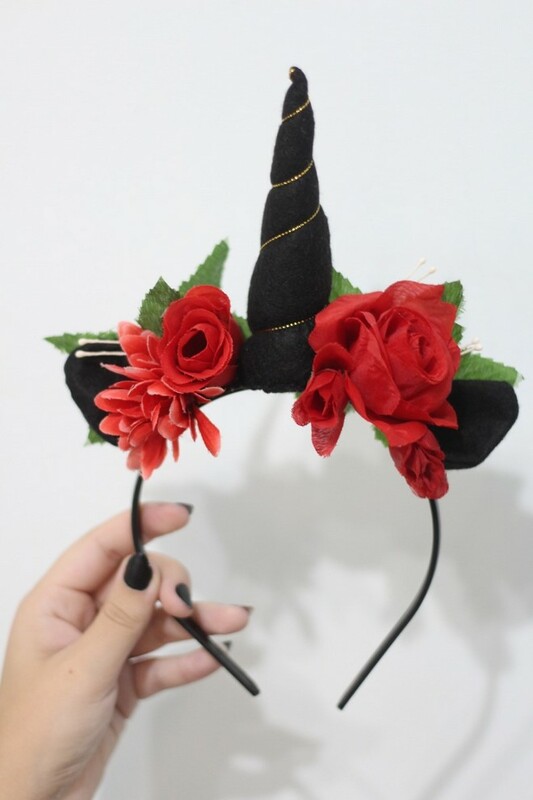 You need only a simple headband, and felt or other material to make the ears and the horn. 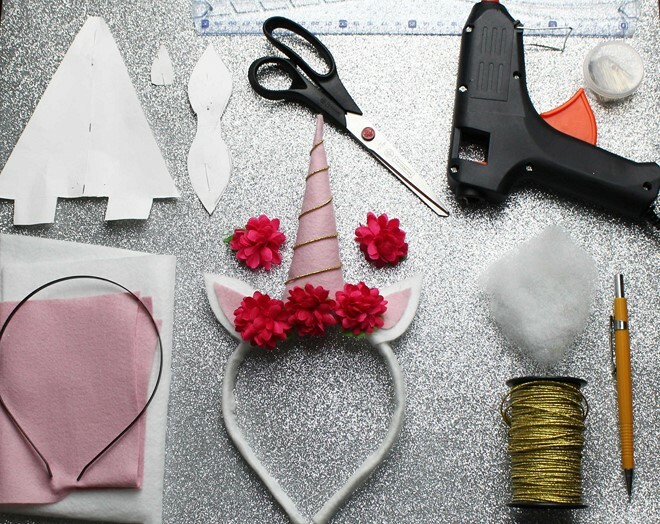 Here is a simple tutorial showing how to make a unicorn horn headband! 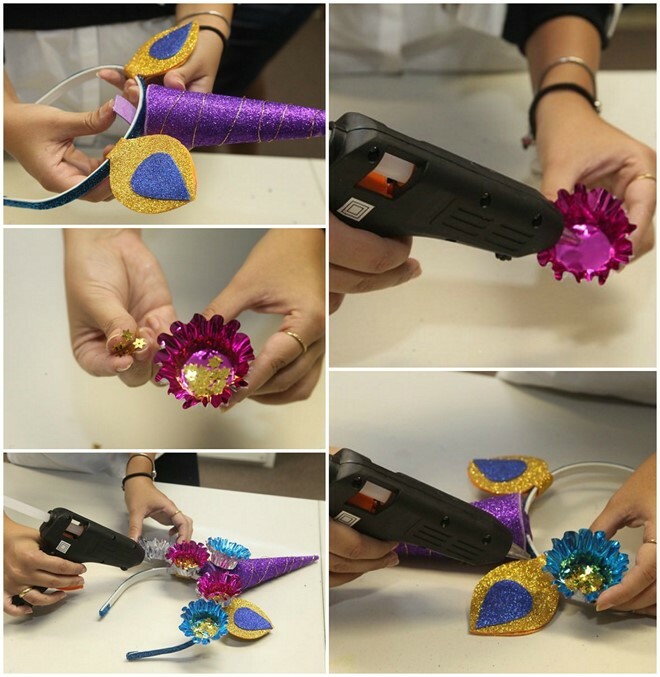 Transfer the horn template on the glitter foam sheets and cut out. 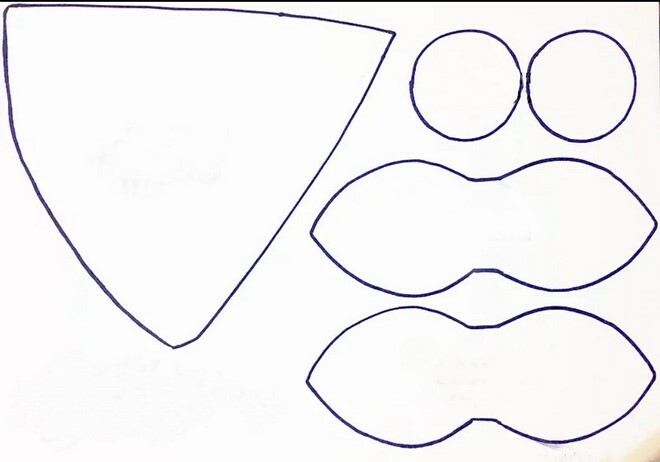 Roll the triangle to a cone and secure the ends with universal glue. 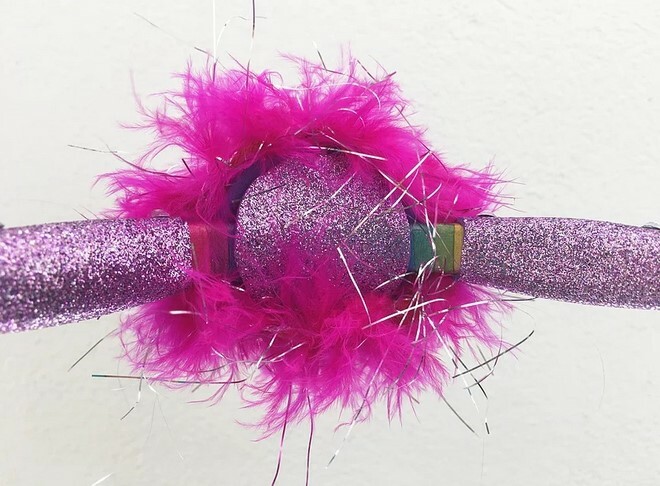 Wrap the metallic thread around the cone and close the base by glueing the circle shape. Apply a thin line of universal glue along the headband and glue the ribbon. Glue the inner and outher ear pieces together. 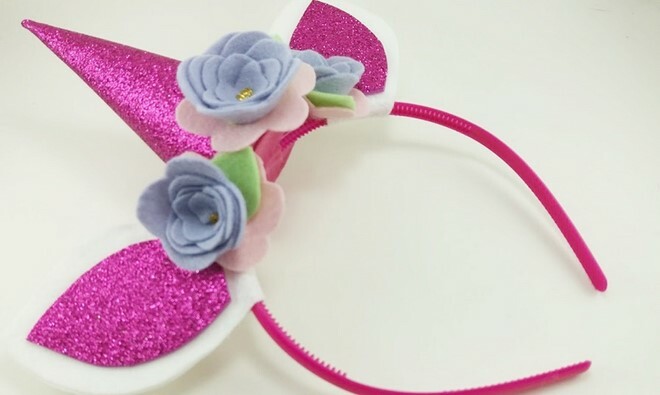 Place the ears on the headband and secure using universal glue. Position the cone on the top of the headband and glue the piece of foam underneath, securing the unicorn horn to the headband. Apply hot glue in the cups and sprinkle the glitter stars. Glue the them to the headband and do not forget to alternate colors. 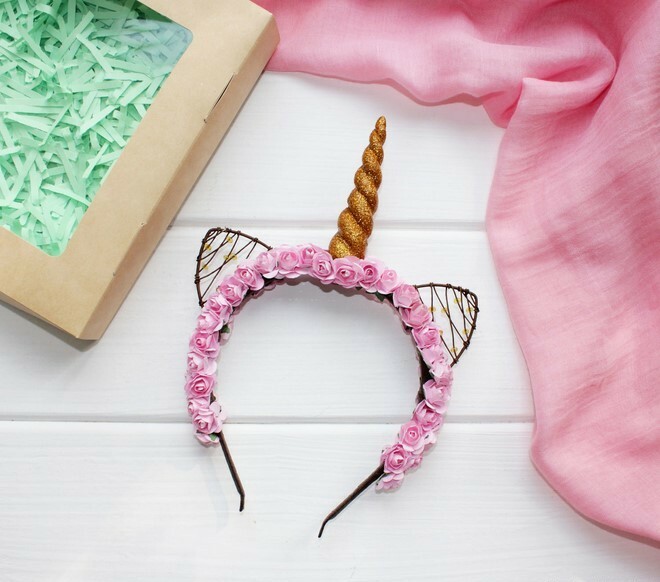 Let dry and your unicorn headband is ready! 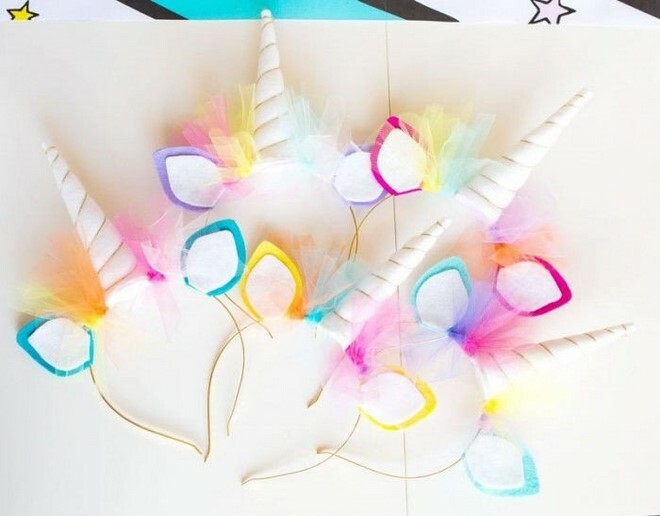 Ever thought of decorating your unicorn headband with feather marabou? It looks very cute and charming! 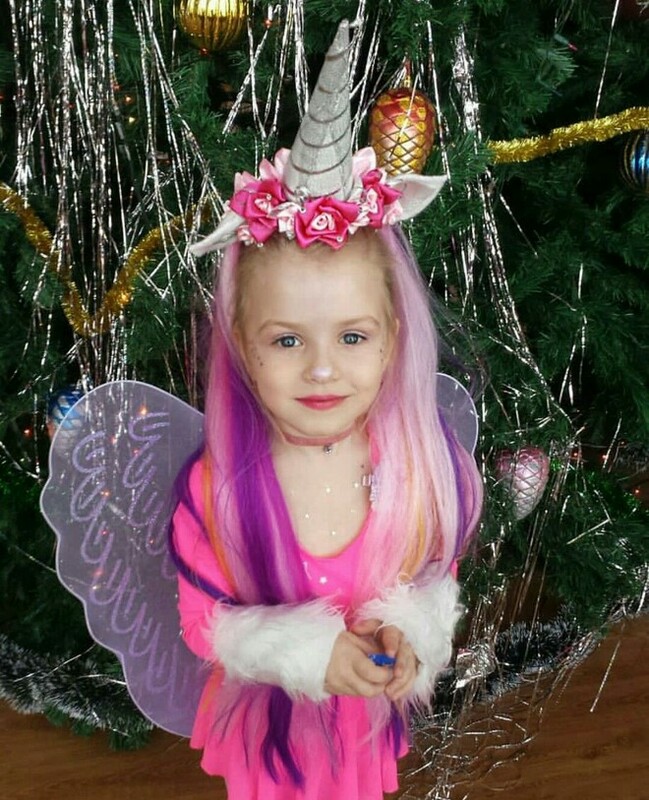 Use light pastel colors to match the unicorn fantasy theme. You can even use feather marabouts to add a tail to your costume. It will be fun! This idea is very simple! 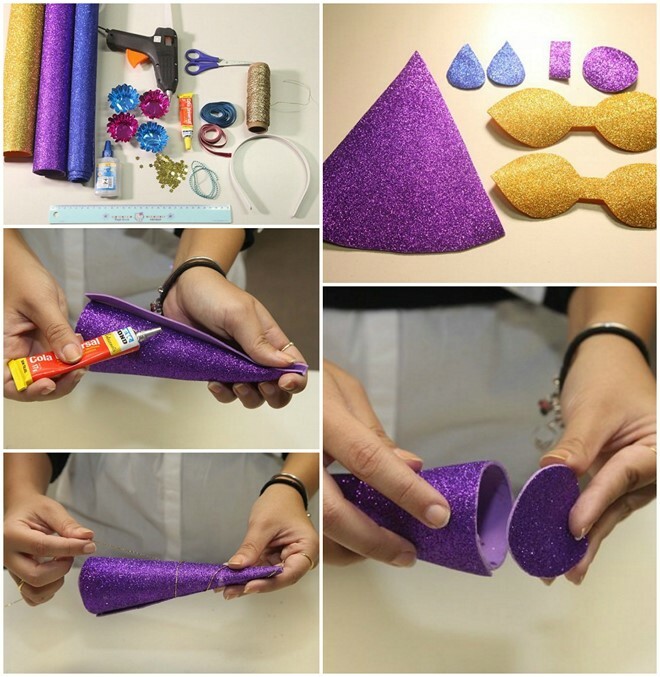 Decorate the space between the horn and ears with small pieces of colored tulle. Super charming and minimalist. Bet on pink, white, blue and lilac tulle to characterize your Unicorn fantasy well. 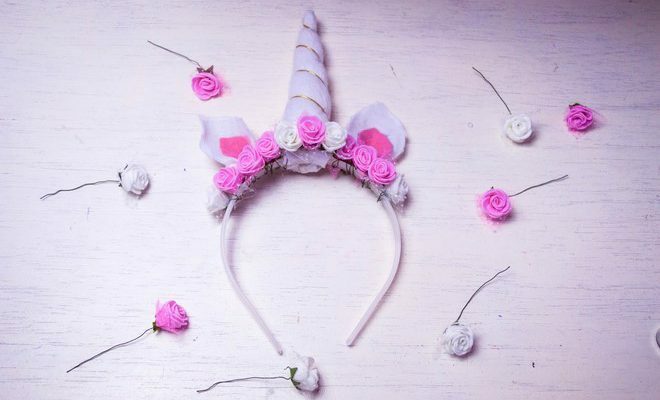 This version of the horn heaband features felt flowers and pink colored plastic headband. 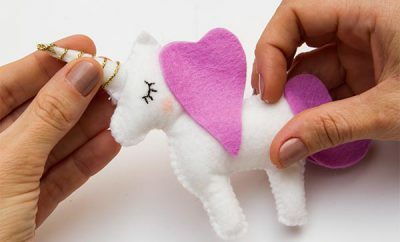 You can glue or sew the horn and the little flowers of felt. The success is guaranteed! Felt is the best ally when it comes to thinking about producing your prop. It is a cheap and very versatile fabric. Some illustrations of Unicorn show the mythical animal with a beautiful rainbow mane. 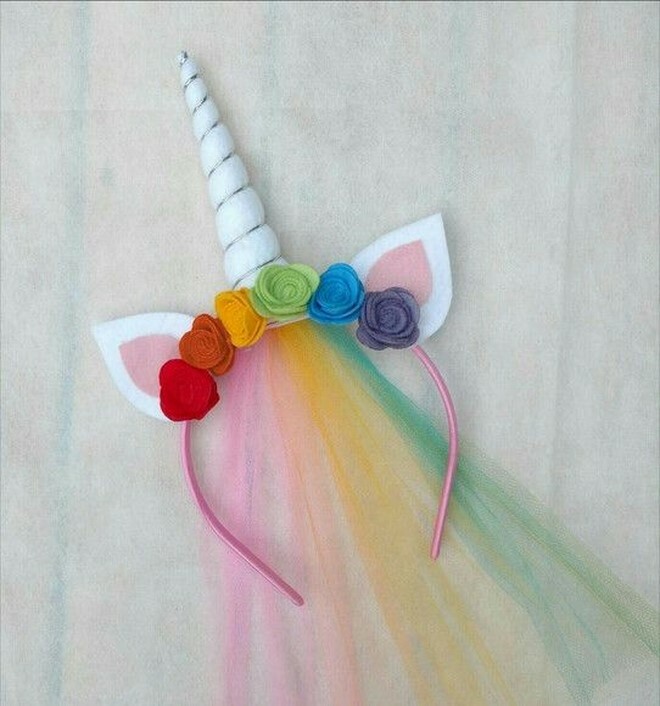 This headband with a veil of colored tulle and ribbon details on the horn represents that image! Do you know those twisted candles that we use in the Christmas decoration? 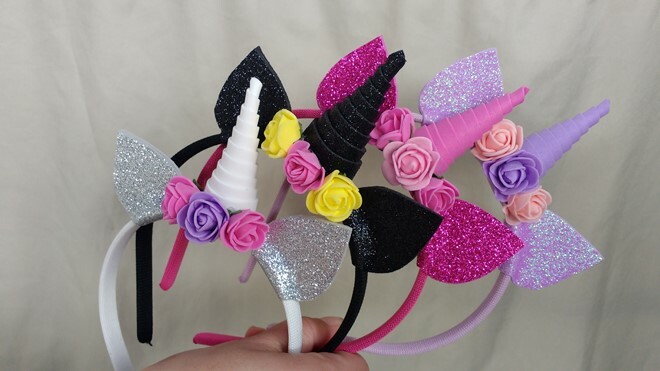 They can be reused for making the horn in a very elegant Unicorn Headband! 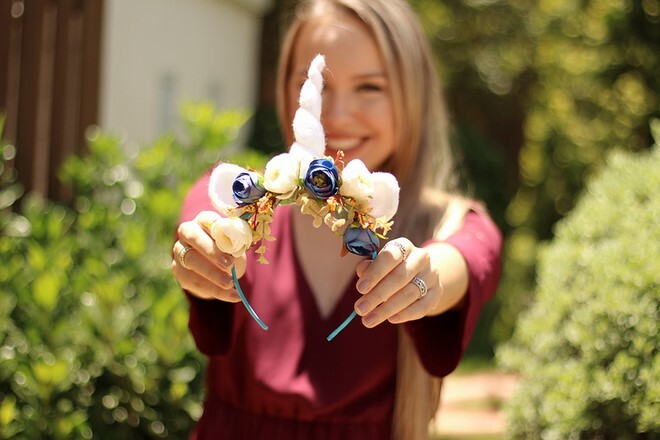 If necessary, paint the candles in a suitable color, do not skimp on the glitter and complete the look with beautiful artificial flowers. This option is proof that you do not have to spend a lot of money to produce such a beautiful accessory. 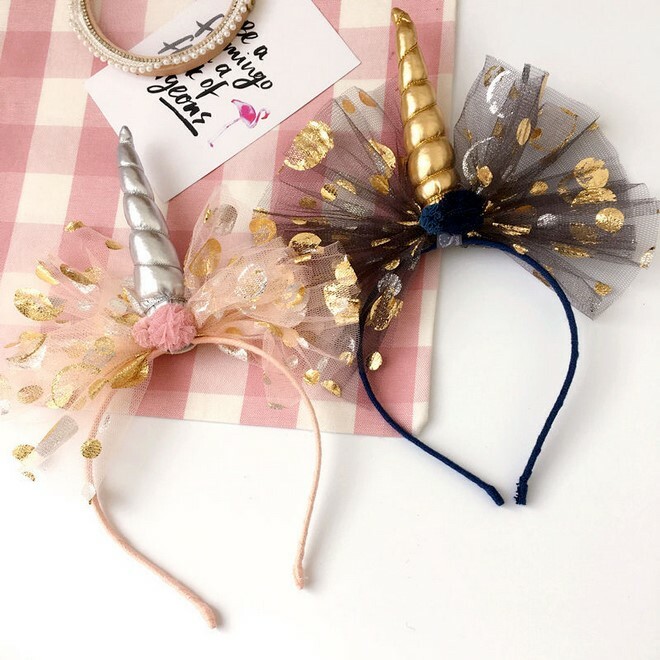 Unicorn headband made of wire can be decorated with beads and have a unique and super original look, as well! Pay attention to the gleam of this golden synthetic leather horn! Add tulle flowers and get ready for the compliments. 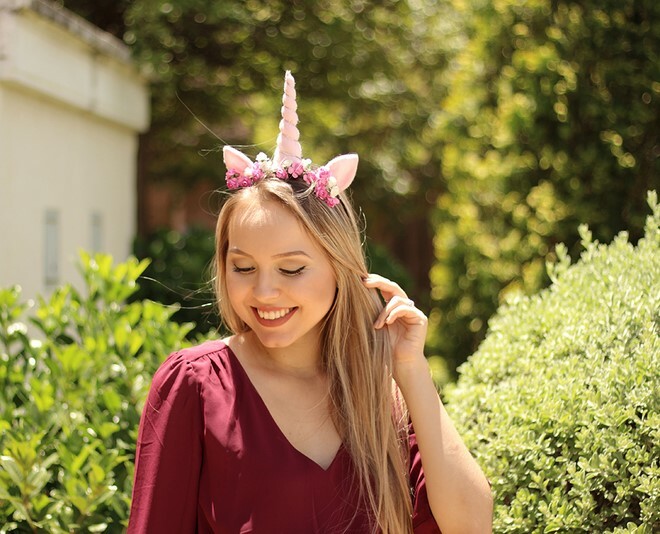 A black unicorn headband would be a great addition to your Halloween costume this year! Red flowers could represent blood!